Udi's Gluten Free Foods are currently available in Colorado, Texas, Minnesota, Utah, Kansas, and New Mexico at grocery chains such as Whole Foods, King Soopers, Vitamin Cottage, Kowalski's Markets, Lund's & Byerly's, United Supermarkets, and Central Market. By late 2009, they should be available at stores nationwide with an expanded line of cookies, cinnamon rolls, bagels, pie crusts, and cake layers. For more information, please visit www.udisfood.com. 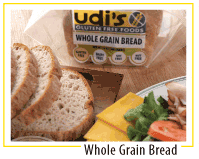 I am so glad that you enjoyed Udi's Gluten Free Bread I know that it is my favorite. I hope you have a chance to enjoy their other items, trust me when I say that you will not be disappointed!